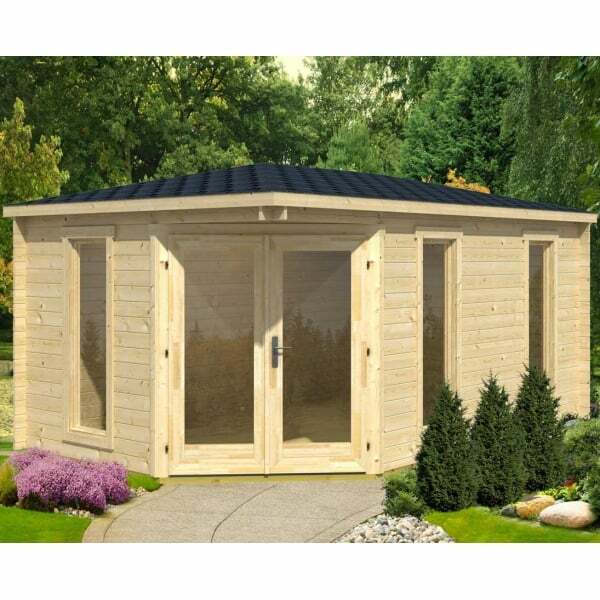 Norland Scotland Log Cabin: The Norland Scotland Log Cabin is a classic extended corner style log cabin / summer house. Unlike many buildings similar to this the Norland Scotland is manufactured using 40mm Chalet Cut Corner Jointed Wall Logs (they are often 28mm) and Double Glazing making this an ideal all-year-round building. The Norland Scotland features Tall, Column Style, Windows which are tilt and turn style opening for plenty of ventilation on those hot summer days and extra wide double doors with full length glass to allow in lots of light and really lend a summery feel to the building. Despite the fact that this is a corner cabin which usually feature a much higher ridge, we have managed to create this cabin with a ridge height of 2.5m to make an attractive yet unobtrusive feature in the garden.